As I sit in the backseat of our truck headed home from our four day snowmobile adventure, I’m torn between several emotions. After five days away I am looking forward to my own bed and seeing my pets. But on the other hand I am sad to be leaving Northeastern Ontario. In just a short time this frigid, snow covered land has won my love. In such a short time this snow covered land has won my deep love. On the first day of our northern adventure we left Parry Sound at 8:30am. 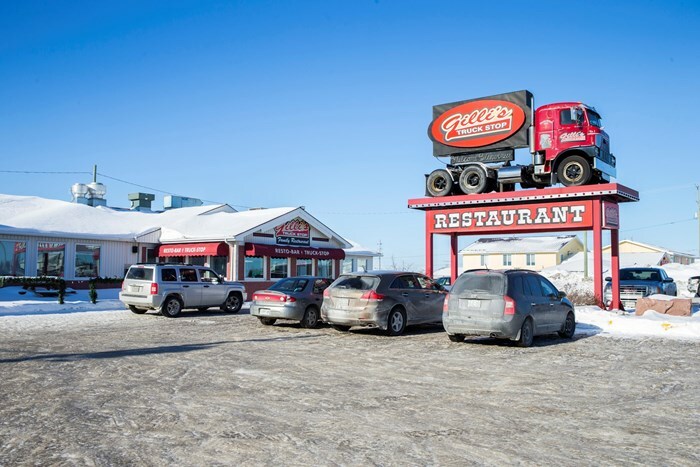 With a quick pit stop in New Liskeard at Gillie’s Truck Stop for a delicious lunch in one of the most unique restaurants I’ve ever seen. Once stuffed full of hot-roast beef sandwich we continued our journey north. At 2pm we pulled into the Comfort Inn in Kirkland Lake. Gillie’s Truck Stop in New Liskeard sure has a unique inside and out! Stop by for some home-style meals! 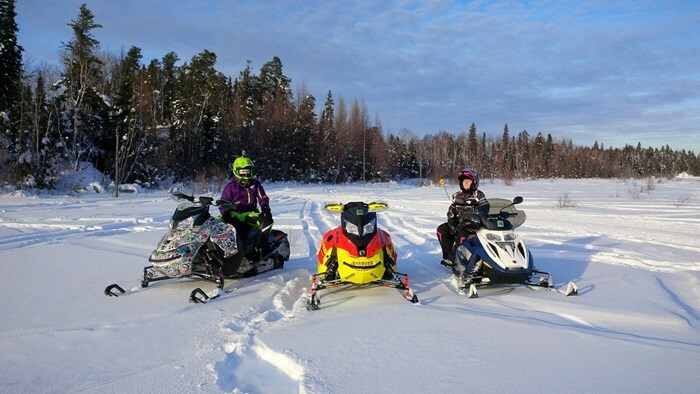 We unloaded our sleds and decided to take advantage of the beautiful day and early arrival time, except our ride didn’t go exactly as planned. We got a little lost in town and ended up on one of only 3 streets in Kirkland Lake where snowmobiles are prohibited. Much to our relief one of the locals went out of his way to tour us through town back to the trail we were searching for. If you’re the guy that helped us and are reading this THANK YOU! On day two we woke up to a lovely snowstorm, packed our bags and headed out on the 180 km trip to Timmins. Learning from yesterday’s mistakes we downloaded the iSnowMobile app, which not only shows you all of the OFSC trails but also pin-points your location! This app certainly came in handy in areas where trail signage wasn’t the greatest. With buttery smooth trails and a breathtaking landscape around every corner getting lost wasn’t so bad. 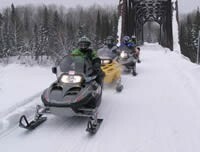 The A trails winds its way through snow covered spruce forests, over farmers fields filled with feet upon feet of glorious powder and through some of remote towns in Northern Ontario. Getting to see old mining communities and abandoned buildings was definitely one of the highlights of the trip for me. For lunch we stopped in Matheson at the adorable Cozy Dinner. This was the perfect place to warm up, fill our stomachs with crazy big portions of food and of course fill our thirsty sleds up with fuel! 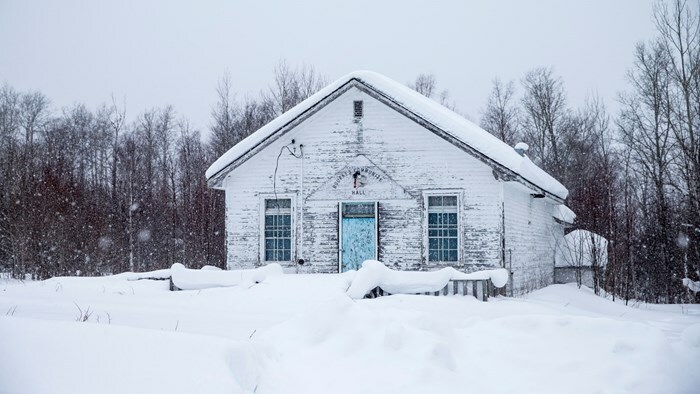 Some of the old abandoned buildings and homesteads make for beautiful photographs. Back on the trail the landscape soon opened up and we left behind the tall thick forests and instead found ourselves in the heart of the north. As we arrived in Timmins a massive snowstorm over took the area. Thankful to be on sleds and not driving with our four-ways flashing on the highway we came to rest at Cedar Meadows Resort. After a long day of riding it was an easy decision to book into the onsite spa for some much needed body rejuvenation time. Cedar Meadows Resort was a great place to warm our feet by the fire place and loosen up some sore muscles from a long trip. The following morning we awoke to a bitterly cold -27 and made the decision to take the short route to Cochrane 90kms away. We had originally planned to do a 230 km ride to Cochrane via Smooth Rock Falls but we were quite happy to have a shorter option. 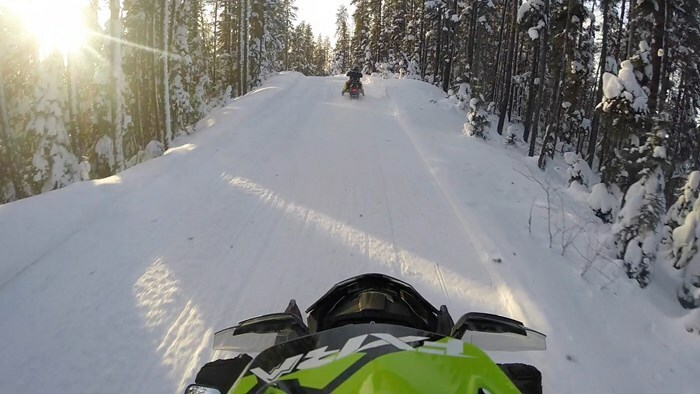 The straight hydro line trails of the north can be thrilling for the speed demon types but they can also be brutally cold. This is certainly a place for two pairs of long underwear and 2 or 3 comfy sweaters! Not to be deterred we made the best of the day and as it turns out, arriving in Cochrane by 1 o’clock gave us a chance to explore some of their attractions. 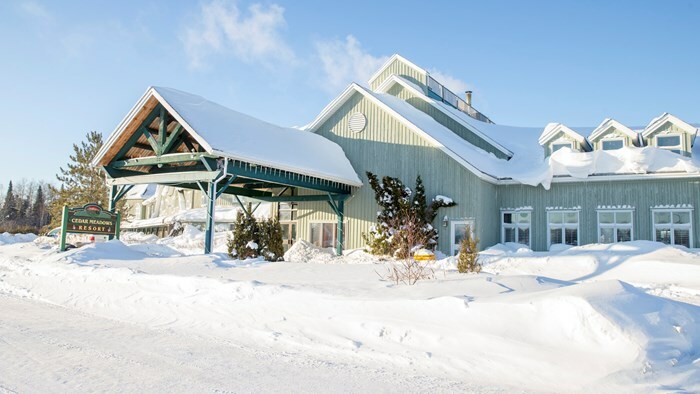 After checking in at the Best Western Swan Castle Inn our receptionist, Patricia, pointed us in the direction of the Cochrane Polar Bear Habitat and we were off in search of Polar Bears! Nothing is quite as exciting as seeing one of these 1,200 pound fluffy giants in person and in relatively their natural habitat. 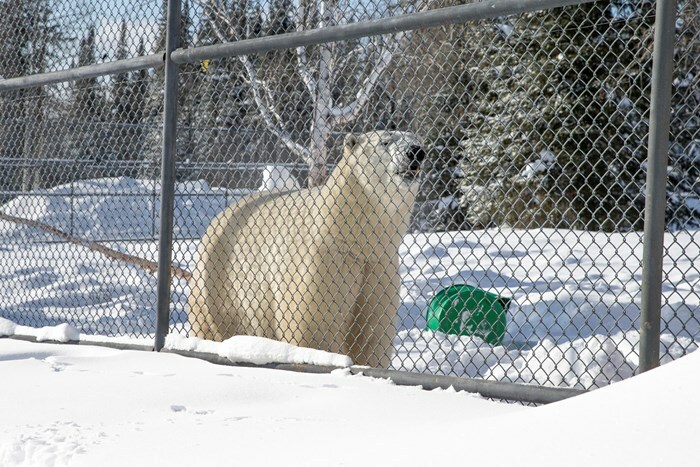 The habitat has two resident bears, father and son, Inukshuk and Ganuk. The Cochrane Polar Bear Habitat and Classic Vintage Rider Snowmobile Museum were a great way to spend Friday afternoon! The habitat is also home to the Cochrane Classic Vintage Rider Snowmobile Museum. This museum had a wide variety of vintage sleds, everything from a 1937 Bombardier B12 Bus to a 1972 Alouette Junior Brute. It was amazing to see just how far snowmobile technology has come although I’m happy to say I didn’t make this 600km trip on a vintage sled! After a day out it was the perfect time to relax in our honeymoon suite at the Best Western. Yes, I had to share a honeymoon suite with my parents, they got the big comfy bed while I slummed it on the couch. I strongly recommend booking your stay in advance as we were lucky to even get a room. 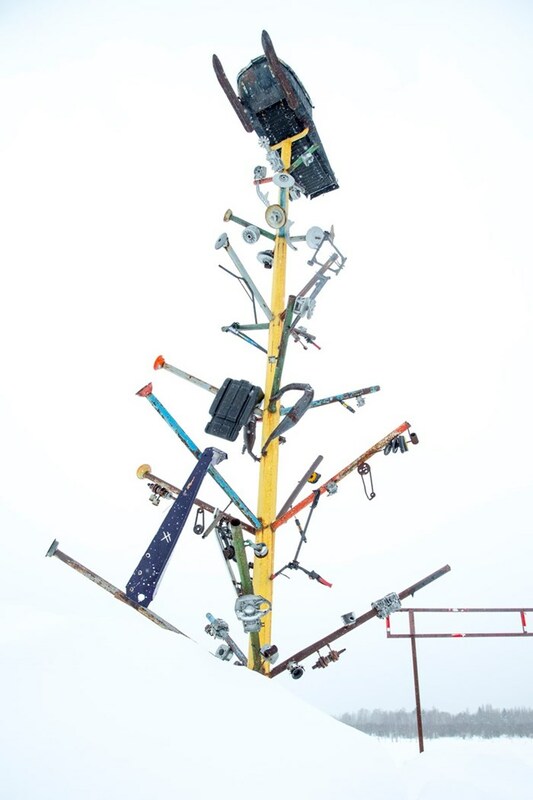 Cochrane is certainly the go-to place for sledders! For dinner we took a short 5 minute walk to what we’ve heard is Cochrane’s best kept secret. 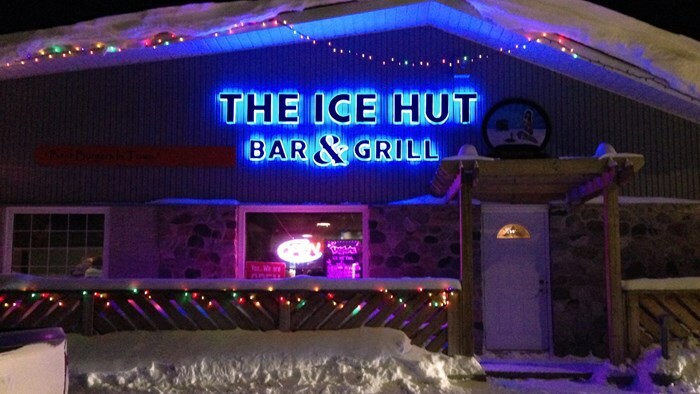 The Ice Hut Bar and Grill on 3rd Street is one of those places that you SERIOUSLY have to eat at! The food is prepared by Red Seal trained chefs and this comes to no surprise once you’ve sampled their massive menu. We also had the pleasure of meeting the part-owner, Jason Mageau, as he was out bussing tables and checking on guests. Now that’s the type of dedication to excellence we can appreciate! The Ice Hut Bar & Grill was the perfect spot to grab some of the best food we’d had all trip and Dad got to watch some sports even! On Day four we headed out in yet another blizzard. Northeastern Ontario sure gets a lot of snow! That’s great for sledders but I don’t know how the locals do it! On our way back to Kirkland Lake we followed the A trail pretty much the entire way. Nice and easy, just a straight shot. While going through the small town of Val Gangé we saw this amazing piece of snowmobile art created by “007” Emile Lamarche! Who wants one?! We stopped again at the Cozy Diner in Matheson as the dollar to portion size ratio was too good to pass up. In the end I let out a sigh of relief when the Comfort Inn in Kirkland Lake finally came into view. Although I had an amazing time on the trails, I was cold and tired and just plain excited for a good night sleep. We ordered pizza to the hotel from Dino’s Pizzeria and slept like there was no tomorrow. Come morning we awoke to -37 before the wind-chill! 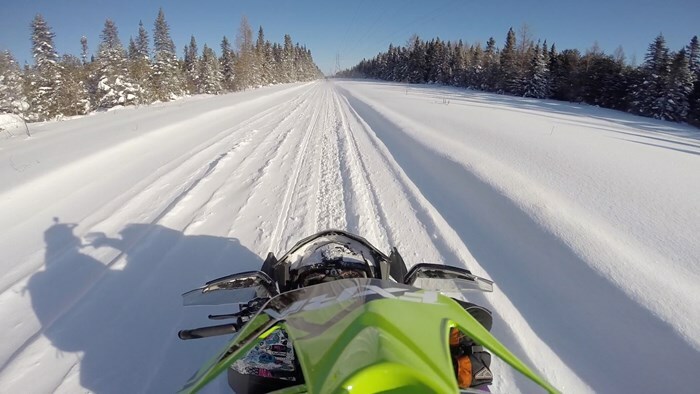 The trails were like little snowmobile highways carved through thick spruce forests, alongside the fence posts of hundred year old farms and across modern day hydro lines. Thank goodness the Comfort Inn had outside power receptacles for your vehicle - there was no issues with starting the truck up to head home. 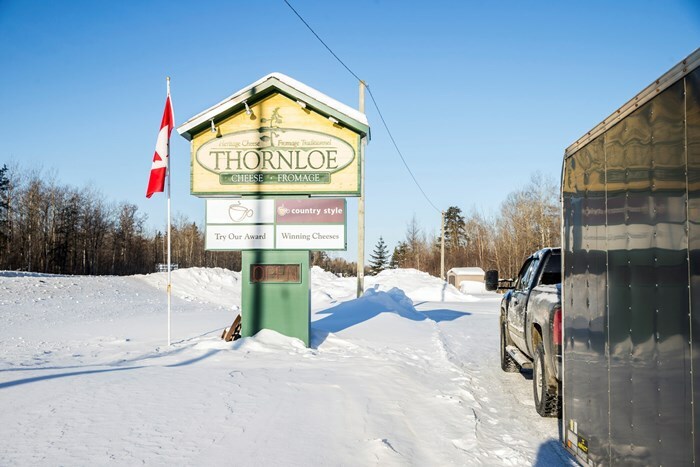 On the drive home we made a quick stop at the Thornloe Cheese Factory just north of New Liskeard and picked up the best souvenirs of the trip; delicious fresh made (and aged) cheeses made with locally sourced dairy. This was definitely one of my favourite parts of the trip! Yes, I love cheese THAT much! The Thornloe Cheese Factory was the perfect way to finish off an amazing trip to Northeastern Ontario! All in all, through the bitter cold, crazy blizzards and getting lost along the way, we had an amazing trip filled with laughter, amazing food and cozy accommodations. 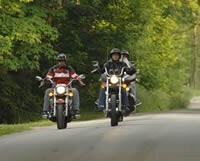 This 600km loop from Kirkland Lake to Timmins to Cochrane and back to Kirkland Lake gave us a great taste of what riding in Northeastern Ontario is all about. Although it can be quite cold at times as long as you are prepared its certainly worth the trip. From the snow-covered landscape to the heartwarming hospitality of the locals this is truly a beautiful place that I will never forget. Now if you will excuse me I think I will continue stuffing my face with yummy cheese curds and fresh baked coconut tarts!